Recorded at the edge of a clear blue lagoon; the ocean gently laps against the shore as the sun shines above. You can imagine diving into the warm waters and feeling absolutely free. Feel the power of mother nature. As refreshing rains fall, deep thunder rolls and the sky lights up. This recording really makes you feel at one with the elements. A 4000 year old wood in the heart of England. In this un-spoilt beauty spot you are surrounded by wildlife and ancient trees. A truly awe inspiring place. Pure spring water flows past in this tranquil setting, reflections sparkle and the world feels calm and peaceful. Just the simple, eloquent sound of a wind chime. A calming, fairytale sound that is mesmerizing and beautiful. The shores of a paradise island. Hear the crickets and tropical wildlife that serenade the ocean. With gentle waves crashing before a beautiful sunset, this is heaven. At the heart of the Amazon, this incredible recording surrounds you in tropical bird song. As the sunlight pours through the trees you can hear the gentle rustling of the leaves and almost feel the rainforest breeze on your face. Water cascades down a beautiful rock face, the fresh waters of this waterfall glisten with light and beckon you in. Sitting beneath the stars. Flames dance as this glowing log fire crackles and spits. The night sky is clear and you feel completely at one with nature. Similar to the preview, you can enjoy a blend of all of the relaxing sounds contained in this album. A calm, sleep-inducing mix of the ocean, wind chimes, gentle rain and much more. 4. Click the link in the email and enter your special code. You will then be able to download the entire album as high quality mp3 files. 5. When you have downloaded the files you can play them on your computer, send them to your ipod or simply drag them into your CD burning software. Each sound file is six minutes long and You can listen to them on repeat or one by one. 6. Each file has been recorded with meticulous care and attention. We have traveled the world to capture the most stunning natural sounds and we really hope you will enjoy listening to them. Relaxation through meditation is something we can choose to do, a kind of conscious relaxation or chosen relaxation. These are words that are more universally understood, more comfortable. Over time you will discover your own ability to reach a state of serenity with greater and greater ease and the natural world collection of natural sounds is the perfect companion. Meditating is actually easier than you might imagine. Most of us have dabbled in meditation by participating in conscious relaxation. Maybe during an exercise class or to manage pain at the dentist or anxiety before a test. We start by paying attention to our breathing. The practical effort to focus completely on our breathing takes our minds away from the "mind clutter" that constantly tries to invade our mind and eliminate feelings that will lead to a time of calm. With repeated effort the goal of clearing your mind to think of nothing, does occur and the process of meditation takes on its own energy. The result is peace, serenity, calmness, eventually opening yourself to new insights. Too much stress, stress reduction, chill out, let it go, detach familiar phrases to all of us. Our world is fast, fun and exciting. It is also challenging, trying, demanding and frightening. These two sides of our lives produce stress, emotional reactions, anxiety, worry and anticipation. Our bodies and minds can tolerate only so much of any of these. After a while, each of us reaches a saturation point and the results become uncomfortable at best; for some it may be unbearable, even unendurable. Sometimes you may weep - you may not even be aware of what is making you weep. It is your own emotions having a voice of their own. Sometimes you may feel a smile across your face - that is contentment showing itself. Sometimes you may fall asleep and awaken truly refreshed. 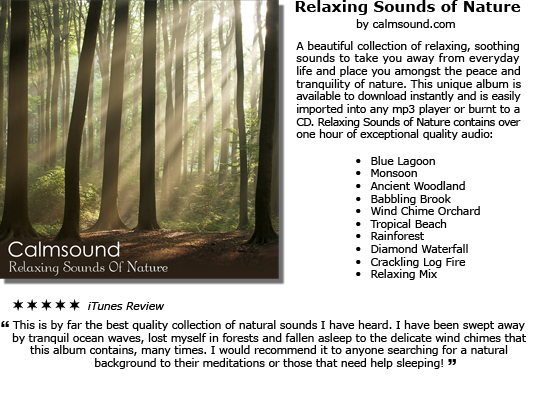 We hope you will enjoy relaxing with the Relaxing Sounds of Nature collection and whilst we encourage you to create your own CD, this collection of sounds is offered for personal use only and you are not permitted to offer the files for sale or free download elsewhere; individually or as a collection. The sound files contained herein are not available for any type of commercial use and remain the copyright property of Big Fat Audio LTD and by downloading this album, you agree to use the sound files in the manor for which they are intended - as a relaxation / meditation aid. If you have any questions, please contact the publisher.